One of the best flowering native plants is Alyogyne huegelii commonly called the ‘Native Hibiscus’. This is a purple flowering, small tree or shrub that grows well in many areas of Australia. With many named cultivars available, flower colour will vary, however always on the purple to lilac tones. Grown for its free flowering nature, Alyogyne huegelii is a very adaptable plant, its natural range is from Western Australia to South Australia. However it grows well in all areas of Australia given a little care. A small to medium shrub to 1 to 2.5m. Long leaves with pink to purple flowers (other forms exist, white and yellow). Flowers are short lived, similar to the Hibiscus but they repeat as does the hibiscus. You will need a well drained soil and a sunny position, however given protection from heavy frosts it will grow well in cooler climates. One of the popular cultivars is A. heugelii ‘West Coast Gem’ a fast growing shrub to around 2 – 3 m in height. 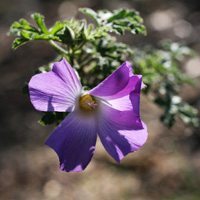 A drought tolerant plant the native hibiscus needs to be pruned to keep it in shape. A well drained soil and a sunny position, but protected from wind. Mulch well and prune back after the main flowering period. Fertilizer is generally not required, however a well drained position is essential. We have found that the Native Hibiscus responds well to pruning, we have pruned our back hard after some storm damage and it responded well. When first planting Alyogyne huegelii is best pruned regularly for the first 3 – 4 years, sacrifice a few flowers early on and you will be rewarded with more flowers and stronger growth.